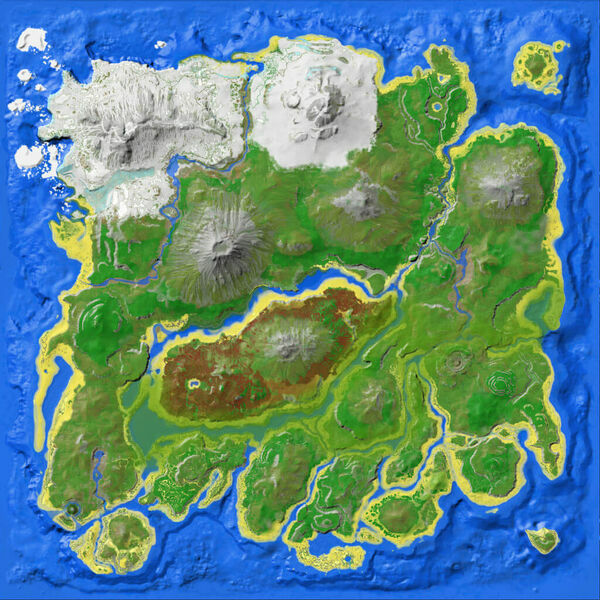 This island's in-game name is "Wilderness", but is often referred to as South Haven, Southern Island, The Lone Island, Herbivore Island. Damien's Atoll is the Spawn Entry name, but the name doesn't show during gameplay. Like the popular name Herbivore Island suggests, its relatively safe since carnivores do not spawn there. However, large herbivores like the Brontosaurus could become aggro and harm survivors. The island's small space and skittish herbivores make for easy hunting. There are also a good number of metal-rich rocks on the island's single hill. Its bay is deep and great for setting up a port or an aquatic creature pen. The land right on the bay is flat and great for basebuilding, but take care not too build too close to the cliffs, or you'll lose your supply of metal. The island is directly south of the Southern Islets. The distance from the mainland and lack of carnivores make the island a perfect location for early players or peaceful tribes. This island is rich in metal nodes and is one of the most consistent places to easily obtain metal early on, accessible by swimming (it takes roughly 40 seconds to swim to the island from its closest mainland point) or if you can craft a raft. If your tribe does not have carnivores yet, or you wish to avoid carnivores altogether, this island is perfect. If you are looking for a herbivore to tame, this is a good place, as they are the only things that spawn, and can be easily taken back with a raft. This island is recommended for beginners because of its lack of danger. Has a small bay that is great for bringing in rafts. Be wary of Megalodon and Manta that spawn around the island, as they frequently swim into the bay or near the shore. Leedsichthys also have multiple spawn points around the island, presenting a danger to rafts. There is an underwater cave on the east side of the island. Trilobites are mostly found in the northern part of the island. The island does not seem to have been given any kind of pass for new land creatures since the release of the game, beside of Pelagornis and Equus/Unicorn. A total of 4 Brontosaurus will be active on the island at any given time. Killing one or knocking one out for tame immediately spawns another to bring the total active back to 4. There is a single Beacon and two Explorer Notes to be found on the island. A third Explorer note is located sometimes at the little isle in front of the north-eastern promontory. Unicorns can spawn on the island, but normal Equus do not, so any Equus found on the island is a unicorn. Titanosaurs also spawn on the island, but in very rare occasions. In real life, paleontologists found fossil evidence of an island with only herbivores on it. Because there were no predators on the island and to efficiently live off the few resources the island has, the dinosaurs living there evolved to become much smaller. More information can be found in the Wikipedia article about Hațeg Island. On the cloth map that came with the pre-order of the game, this island is labeled as Damien's Atoll. This name is not used in-game, and is otherwise only mentioned by spawn regions in the devkit. This page was last edited on 18 April 2019, at 09:31.